James M. SCALF was born about 1874. He was the son of Simpson M. SCALF and Sarah Malinda PIERSON. 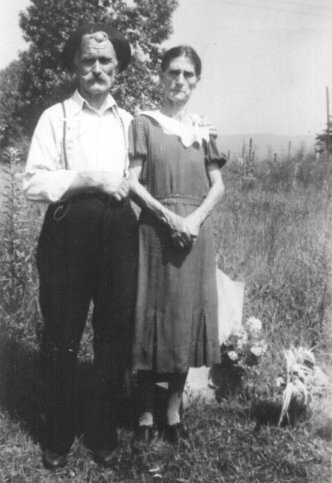 He married (1) Mary FLANARY on October 28, 1898 in Scott County, VA. He married (2) Louisia E. REED March 31, 1899 in Scott County, VA. She was born October 27, 1873 in Scott County, VA. She was the daughter of Burdine REED and Mary ?. James’ father, Simpson M. SCALF was born 1850. He was the son of Berryman SCALF and Rebecca Myrtle PAGE. He married Sarah Malinda PIERSON February 03, 1869 in Scott County, VA. James’ mother, Sarah Malinda PIERSON was born April 1852. She was the daughter of David PIERSON and Malinda PETERS. Barbara Ellen SCALF, born March 14, 1873; died July 17, 1962; married Allen BLEDSOE August 17, 1888. James M SCALF, born Abt. 1874; married (1) Mary FLANARY October 28, 1898 in Scott County, VA; married (2) Louisia E. REED March 31,1899 in Scott County, VA.
Mary C. SCALF, born 1876 in Scott County, VA; married D. MANESS. John D. SCALF, born January 1878 in Scott County, VA; married Isabelle FISHER May 12, 1900 in Scott County, VA; born March 31, 1879 in Scott County, VA; died November 08, 1951. Mamie Caroline SCALF, born February 1883 in Scott County, VA; married Octovis BENNETT. Malcolm SCALF, born March 1891 in Scott County, VA; married Bessie Mae LAWSON 1924 in Lee County, VA.
Curtis Vernon SCALF, born October 07, 1894 in Scott County, VA; died March 1974; married Letha JONES. Photo is the property of Wayne Duncan. I am the granddaughter of their child, Eugenia Roberta Scalf…would love to see more pictures….where is my grandmother in that profile picture?